Patrick Kunz of TAL (Togu Audio Line) released an impressive revision of his free VST and AU plugin UNO-60 today. A full featured and faithful model of the Roland Juno 60. This plugin is absolutely superb. I’ve followed TAL since they delivered their first freeware plug years ago, and offered back then to help him to test in the AU format (so I could use his plugins in Logic Audio as well.) He’s a lovely guy, a brilliant and generous developer. 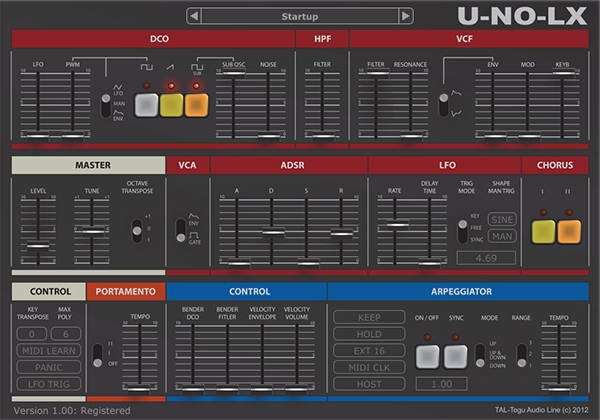 The U-NO-LX is the first paid plugin from TAL. That’s a little shocking, but considering that music and plugins don’t seem to actually make any money in a world of freebies these days and after all the free software TAL have given away over the years I have to admit I was delighted to spend the money on this wonderful plug in. As of this writing I’ve scored the demo plugin, and purchased the serial number, however I’ve received no word yet from either paypal or TAL regarding the serial. But I do believe I will.